We all that know every student in LAUTECH will always be proud of his/her department but despite this , there are still Top 10 leading departments in LAUTECH presently and I bet with you that you'll almost agree with me . This department carries much charisma and it's student have been outspoken and colorful with their works in the LAUTECH campus , for example the statues along and chemistry shed , FAA department and other notable places have , at least , beautify the school . Lol , ladokites find this department funny , yeah , some call them Agbeloba , some call them Animal Pursue Human and other hilarious names , but we should know the fact that the current LAUTECH No.1 student(Hon. Abiodun Laurel) is from this department and his contestant also . They shown gallantry by stepping forward to lead the school student union . Department with decent men and ladies , intelligent guys and currently topping the NUESA list of best graduating student . It's indeed an achievement. Department of geniuses , creative niggas , ambitious men and breathtaking ladies . They are commonly known for representing LAUTECH in inter-school debates and have won rizes. The only department in LAUTECH to have a solar panelled NOTICE BOARD relative to the department . That shows that the guys there are not smiling at all . They are bookworms and very intelligent guys . They've produced two of the most toughest course in LAUTECH EEE 232 and 231 and they record at least 6 first class student in the department since 2006. 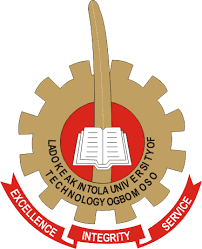 This is the top department in LAUTECH with the best programmers , footballers , entertainers and intelligent students that have gone beyond the walls of LAUTECH to prove their worth .